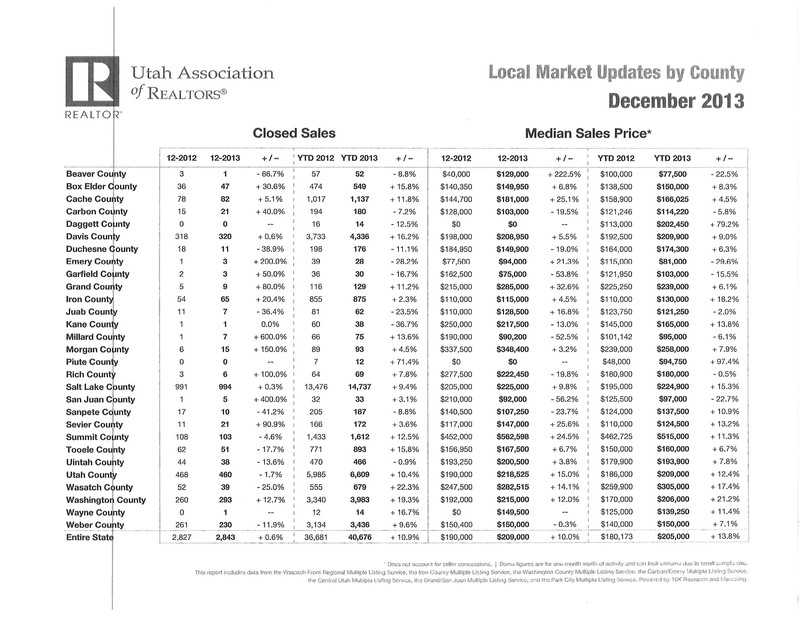 The Utah Association of REALTORS (UAR) Local Market Updates by County are now available for December. It usually takes UAR 2 to 3 months to compile all the information for this report. The statistics for all counties in Utah are attached. Iron County Median Sales Price is now $130,000. The number of closed sales is up 2.3% Year To Date (YTD) as compared to last year. December 2013 closed sales were up 20.4% as compared to December 2012. This is good in our opinion since December is sometimes our slowest month and December 2013 was positive. Our real estate market continues to improve “slowly but surely” as my mother would say. Homes under $200,000 are still the top sellers in our area and the inventory is down in those ranges making a steady market. We are still seeing multiple offers on some homes. Homes in upper price ranges are also selling when priced for the market. Owners moving up to higher priced and more spacious homes are in the market as well as first-time home buyers. Some owners are downsizing too, so we have local buyers as well as buyers moving here from out of state. Investors are attracted to the bargains still available and the low interest rates. Primary home-buyers get top priority when bidding on many of the foreclosures which is causing the investors some grief because the homes are often sold before they can make an offer. We do have foreclosures and short sales still available, and resale owners must price competitively. New construction homes are selling, and there are beautiful new homes for sale. Lots and land parcels are selling but typically at bargain prices in order to keep the new home affordable when built and in order for the appraisal to come in a range that qualifies for the home loan. We seem to be getting more calls on commercial properties, but those are still not moving quickly. Developers are slow to get back into the market due to high cost of developing and unavailability of loans. 1. Aggressive marketing; 2. Market sales price; 3. Shows well; 4. Show anytime. As far as I know, there is no one that markets more aggressively than our Naisbitt-Bagley Team, and we will continue to do so in order for our homes and properties to sell quickly. Home pricing and show-ability are as important as top marketing, but those are both up to the seller. Our Naisbitt-Bagley Team is happy to provide helpful information, data, suggestions and advice. The vast majority of buyers are now purchasing as a result of online advertising, and they have typically already made a list of which homes or properties they want to see before they call to make an appointment. Therefore, our Team advertising goes all over the world. When buyers tour real estate, they choose the best of the best. Therefore, it is extremely important to have your home or property in show-ready condition. You want your real estate to look nice enough to be pictured in a home magazine because the buyers are looking at videos, slide shows, and/or pictures of your home or property in order to choose which homes they want to tour.